The Deputy Chief and I are the only full-time members of Oyster River Volunteer Fire Rescue (ORFR) and employees of the Comox Valley Regional District (CVRD). It gives me great pleasure welcome readers to our official web site on behalf of our members. The Department continually strives to improve the services we provide to visitors and residents of the communities within our fire protection area boundaries. The ORFR fire protection area covers nearly 200 square kilometers where we answer 250 calls each year to serve approximately 8000 people. Our professional team of 35 volunteer firefighters trains to meet the National Fire Protection Association Standard for Fire Fighter Professional Qualifications and certification by the International Fire Service Accreditation Congress and the National Board on Fire Service Professional Qualifications. ORFR is a Full Service Operations Fire Department according to the British Columbia Fire Service Minimum Training Standards. Since the spring of 2013, the Oyster River Fire Hall has been participating in a program to reduce its use of hydroelectric power through the use of solar panels. The panels, installed on the roof of the fire hall, produce electricity that supplements the feed from BC Hydro. This chart will provide you with an overview of how we're doing at saving energy. As of 1 April 2019, Burn Permits are required for all fires over 50 cm in diameter in the Black Creek/Oyster Bay Fire Protection Area. Permits are available Tuesdays, between 5pm and 6pm, at the firehall. If you have any questions please call the duty officer at: 250-830-7155. Interface fires often start as small accidental ignitions. FireSmart standards are aimed at helping interface residents to prevent interface fires. Follow this link to download the current BC FireSmart manual. Chimneys. Chimneys should be constructed to meet current British Columbia building code requirements and should have approved spark arrestors. Burn Barrels. Burn barrels should be located well away from buildings and other combustible items. Burn barrels should have proper ventilation, screens and should never be left burning unattended. For safer disposal, take your debris to a landfill site. Power Lines and Propane Tanks. Vegetation should be cleared well back from power lines, propane tanks, and other fuel supplies. Emergency Access. FireSmart building sites have adequate access for emergency vehicles, with an on-site emergency water supply such as a pool, pond, or tank. Shovels and Rakes. Every home should have shovels, rakes, axes, garden hoses, sprinklers, and roof ladders to assist in suppressing wildfires. Visit BC Wildfire Service for more details. Oyster River Fire Rescue has successfully passed the Superior Tanker Shuttle Service. This means that ORFR can supply enough water to have some areas without fire hydrants qualify as having a fire hydrant within 300m of their house. 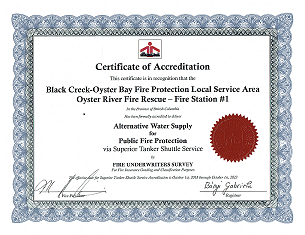 Fire Chief Bruce Green says "Now that this achievement is in place, residential property owners in the Black Creek Oyster Bay Fire Protection Area should know that they can contact their insurance provider to discuss if their property qualifies for any benefit on their premium of the fire portion of their residential policy." Click on the image of to download a full size copy to provide to your insurance broker. 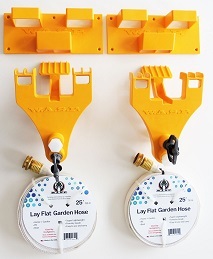 WASP gutter mounted sprinkler systems are available at the Oyster River Fire Hall for $130 per set. The kit contains two sprinkler heads, gutter mounts, and weeping hose. The system is easy to instal on gutters or facia. On 21 December 2018, Oyster River Volunteer Fire Rescue Association presented CVRD Electoral Area C Director Edwin Grieve and Black Creek-Oyster Bay Services Committee Chair Brenda Leigh with the keys to the new fire services equipment. ORVFRA purchased the new equipment with monies earned from provincial wildfire deployments during the summers of 2017 and 2018. Comox Valley Regional District bylaws relating to fire protection have recently been amended. Naloxone is a life-saving drug that temporarily reverses the effects of an opioid overdose. Within 1 to 5 minutes, naloxone can reverse slowed breathing. Naloxone should be given to an unresponsive person, particularly if they are breathing slowly or not at all. BC has a Take Home Naloxone program in place to reduce the harm and deaths associated with opioid overdoses. The program provides training in overdose prevention, recognition, and first aid response. are First Nations' and living in BC. The FNHA's First Nations Health Benefits plan will cover the cost. If you are not eligible for the free kit, you can purchase naloxone and related supplies, as well as overdose prevention and response training. Click here to find a nearby pharmacy where you can obtain this life-saving kit. Remember, only WORKING smoke alarms can save you. Recently, there was a worldwide recall of over 40 million fire extinguishers, and although the manufacturer is Kidde, they were sold under numerous brands. So, if you have a fire extinguisher with a plastic push button or plastic handled, go to the following site to see if it is one of those recalled. If it is, Kidde will provide you with a free replacement. For details go to: http://healthycanadians.gc.ca/recall-alert-rappel-avis/hc-sc/2017/65014r-eng.php. The Comox Valley Regional District (CVRD) board has approved the Oyster River Fire Rescue department as the fire protection service provider for the Mount Washington resort community. All children's car seats and booster seats sold in Canada have an expiry or useful life date on them. ORFR and the Comox Valley Emergency Program (CVEP) offer Personal Emergency Preparedness (PEP) training free of charge to local residents. Sessions are held at the Oyster River Fire Hall on a regular basis. Please watch this space for future dates and times. To register and place your name on a wait list, please call ORFR at 250-337-8121. Firefighters and First Responders can find your residence only if your address number is well marked. Reflective address signs can make a difference that might save lives. Visit www.911reflectivesign.ca/ to learn more and order yours today. 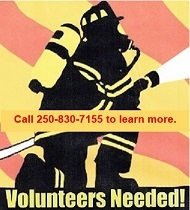 Applications for prospective volunteers are available at the Fire Hall every Wednesday evening between 18:30 and 20:30.